Perhaps you think fairies are figments of the imagination, or even relics of an ancient past. You may even think all fairies are lovely winged creatures, who dance in bluebell fields, granting wishes to anyone who should encounter them. You would be wrong on all counts. Fairies are very much alive today, and they are everywhere—in our cities, our backyards, and even our kitchen cupboards. Some of them are indeed the sweet-tempered, winged creatures of folklore, but the fairy family also includes goblins, trolls, brownies, and other strange creatures, some of which are revealed to humans in this book for the very first time. While many fairy breeds are harmless, others can be quite nasty or even dangerous. In this luxuriously illustrated guidebook, preeminent fairy expert Miss Edythe McFate shares her knowledge of the modern fairy world and includes practical advice on matters such as how to tell a good fairy from a bad one, how to spot a “fairy ring,” how to tell the difference between dwarves and trolls (one species is far deadlier than the other), and how to defend against fairies who would do you harm. Also included are eight true cautionary tales about children who have encountered fairies in ultramodern New York City. 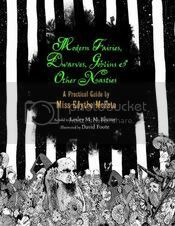 Modern Fairies, Dwarves, Goblins & Other Nasties: A Practical Guide by Miss Edythe McFate is a charming little book about, as the title says, modern fairies and their kin and how they are dealing with living in a modern world, in particular NYC. The fictional Edythe McFate, who in her 70s has devoted her life to the study of fairies, tells us both historical facts about the types of fairies in the world and information about their likes and dislikes, and ways to either protect yourself from the more malicious types or ways to thank the more helpful variety. Interspersed throughout the book, she has also included stories of the "real life" adventures that some children who have had direct dealings with fairies in NYC, and not all of these stories end with a happily-ever-after. David Foote's black and white illustrations throughout the book are a delight. He embellishes almost every page, if at least not with an illustration but with an artist flourish that just adds to the overall "feel" of the book. I can say that I enjoyed his illustrations just as equally as I did the stories. Written for a younger crowd, i can't see how this book wouldn't be enjoyed by anyone of any age who are interested in fairies and want to learn more about them.